Posted on Mon, Feb 20, 2012 : 1:36 p.m. When the NHL begins its month-long rental of Michigan Stadium on Dec. 1, it promises to be a good neighbor. Any extra noise, and the NHL is required to put it in writing before the game. Adding live or recorded music? The university will get at least 30 days notice. Planning fireworks? That requires 90 days notice. 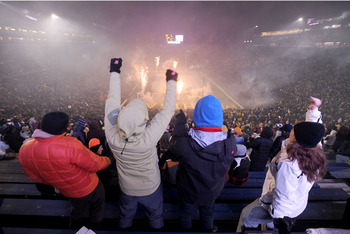 The NHL must give at least 90 days notice to the University of Michigan if it plans to use fireworks at the Winter Classic. The NHL expects to draw about 115,000 fans for the Winter Classic, and the agreement with the university makes it clear that for $3 million, Michigan Stadium is, for the most part, an NHL venue for 30-plus days. The university will even rekey locks in areas designated for NHL use. Parking: The NHL can use the same lots the university controls for Michigan football games. Michigan officials will work with the NHL to set up agreements for non-university lots and shuttles. One potential hitch: If the game is delayed to Jan. 2, many university lots may not be available because that is a regular business day. Expect to hear the phrase “Big House:” The agreement allows the NHL to use the phrase Big House in its marketing of the Winter Classic, including in logos. The liquor license: The university must obtain a liquor license for Winter Classic by June 1. The end of the deal: The NHL must be out of the stadium no later than Jan. 9, 2013, because the university begins its winter term that day. Sounds absolutely horrible! The stadium noise is bad enough now that everything is piped through those absurd speakers-my grandson left his first game because of the noise, and he is hardly a wimp--but this will be pretty bad. Let's sue NHL!!!!!!!!!!!!!!!!! Whoopee! Mon, Feb 20, 2012 : 8:12 p.m.
And where in the contract are the rights of the City and residents to peaceful enjoyment of their property? Who pays for the safety services and the clean up? When will the UM begin to pay something, anything to it's host city and it's residents instead of taking them for granted? Indoor events are one thing, outdoor evening events with drunk pro sports yahoos are something completely different. Tue, Feb 21, 2012 : 1:31 a.m.
Let me get this right--this event will bring 14 million dollars to Ann Arbor, I'm sure Toronto fans are already booking hotel rooms, the city of Ann Arbor will be spotlighted nationally, and yet you think UM is taking things for granted? Mon, Feb 20, 2012 : 8:26 p.m.
You need to change the needle on that broken record. I also believe the NHL contract requires all kids to stay off your lawn. Mon, Feb 20, 2012 : 6:53 p.m.
&quot;Language in the 52-page contract between the University of Michigan and the NHL notes that the Jan. 1 Winter Classic featuring the Detroit Red Wings vs. the Toronto Maple Leafs in an outdoor game in the stadium "will cause noise at levels similar to that of University home football games." Is the NHL aware that Michigan football has been known on occasion as the quietest 100,000+ people in all of sports? If I was the NHL I'd want a buffer on that clause . Especially given the large number of rabid hockey fans that may be cheering on the Leafs. Maybe &quot;...will cause noise at levels 1.5-2.0 times that of University home football games." Mon, Feb 20, 2012 : 6:44 p.m. Anybody within noise distance from the Stadium also have the opportunity to collect big bucks for parking if they choose to do so. Many know of the traffic and after game tie ups in the neighborhood. Alcohol at the game will be a first (legally). Extra police and emergency personnel I am sure will also be kept busy.